These days most of the Tokyo press conferences for Hollywood movie stars take place in Roppongi at either the Midtown Ritz-Carlton or Roppongi Hills Hyatt, which is good because it saves me the trouble of trucking out and up to the 35th floor of the Hyatt in Shinjuku (where Lost in Translation was filmed), which used to be the default venue for these events. 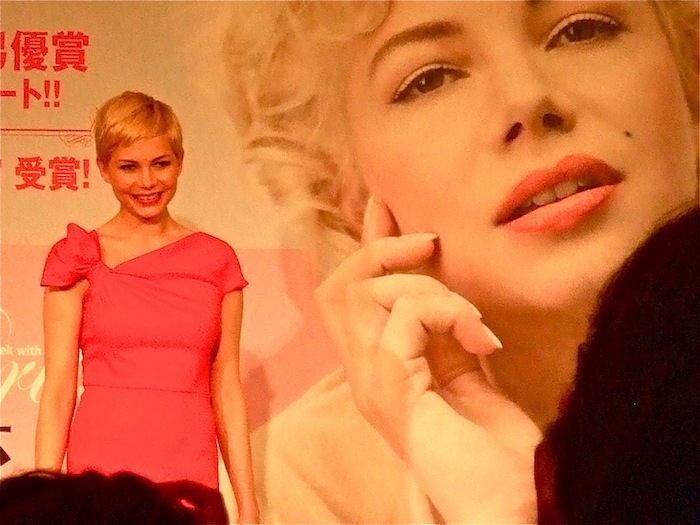 The Hyatt, however, replaced the Imperial Hotel in Hibiya as the default venue, so it was like old times when it was announced that the press conference for Michelle Williams and My Week With Marilyn would be held at the Imperial. My Week With Marilyn is about Marilyn Monroe’s trip to England in 1956 to film The Prince and Showgirl, which was directed and by starring Laurence Olivier, and the Imperial is where, several years earlier, Monroe has spent her honeymoon with baseball great Joe Dimaggio. The connection, or the “synchronicity,” as Williams, who played Monroe and was nominated for an Oscar for her effort, put it, didn’t really get as much play as you might expect, so those journalists who may not have known about the fact beforehand will have to work it into their stories through their own research. When asked how it felt to stay in the same hotel, the actress tried to give a useful answer. “I was 30 when I made this movie, and Marilyn was 30 when she made The Prince and the Showgirl. We shared a dressing room at Pinewood Studios. We shot at many of the actual locations, so being here in the same place, the same hotel, feels like another slightly magical event along the road.” Since she basically answered two question with that one answer, you could sense a rustle among the reporters as they tried to think of a different question than the one they had already prepared. It was probably all the same question, too. It shouldn’t have been difficult to come up with something about the movie, which was proficient and entertaining in that it showed us some famous people (Olivier, Vivien Leigh, Arthur Miller, Paula Strasberg) in a slightly different light, but Monroe is such an icon, in every sense of the word, that to talk about something other than the late screen siren’s impact on the world and how that impact affected Williams’ life seemed inconceivable. The problem is that Williams had only limited things to say on the topic, and as courteous and helpful as she wanted to be she had trouble satisfying the media’s desire to know just what it was like to inhabit Marilyn’s persona for a full month. She was on steadier ground about her methodology, though it hardly seemed unique in terms of what any actor does to prepare for a role. “I saw everything,” she said. “Everything was important to me, from her very early appearances in TV commercials and radio; even some of her movies that aren’t as artistically successful. Like, I think River of No Return is not a great movie by any stretch of the imagination, but I love her performance in it. I love her voice in it. So everything is good material, as far as I was concerned. And the singing, I spent probably ten months preparing to play this role and probably there’s three weeks of actual singing rehearsal in those ten months.” When asked what her favorite Monroe film is, she answered, “Some Like It Hot,” which, of course, is everyone’s favorite Monroe film. Williams was able to dig a little deeper about the difference between her and Monroe in terms of emotional resilience, which hardly seems an issue. Few movie stars were as famously vulnerable as Monroe, and any identification would have been anathema to an actor with similar vulnerabilities. “I feel that I have a better internal support system than Marilyn did,” Williams said, as if describing the engine of the car she just bought. “I think I’ve learned to make a support system wherever I go. Typically when you make a movie you don’t know a lot of people, but the experience of being in a location together, working long hours on a creative task, that bonds you and definitely I always find two or three people that I’ll know for the rest of my life. I don’t travel with constant hair and makeup people, but I definitely make those relationships once I’m on the set.” In other words, she doesn’t have an entourage, but except for Strasberg, neither did Monroe. In the end, Williams didn’t really have anything to add to our understanding of Monroe, which is taking nothing away from her as a professional. She’s an actress, not a historian or a psychologist, and the fact remains that few movie stars have been analyzed and memorialized as thoroughly as Marilyn Monroe. I was much more interested in learning about Kenneth Branagh’s caustic portrayal of Olivier, or whether Emma Watson, in her first serious post-Harry Potter job, is fun to be around. I think it would have livened up the proceedings and loosened up Williams. When someone finally asked the inevitable question about what she wanted to do in Tokyo, she said, “I’m so happy to be a tourist and go wherever somebody takes me. I just want to follow along.” The problem is that no one in the room had any interesting places to take her. This entry was posted in Media, Movies and tagged Imperial Hotel, Kenneth Branagh, Laurence Olivier, Marilyn Monroe, Media of Japan, Michelle Williams, My Week with Marilyn. Bookmark the permalink.